Does it surprise you when you see organizing experts working on organizing projects? The reason I ask is this. When I organize alongside my online class participants, inadvertently someone is surprised that I have an organizing project to do in my home. Does this surprise you, too? If so, you may believe that once someone gets organized that’s the end of it. Staying organized just happens. The truth is, being organized is an ongoing process, not a one-time event. You have to take steps to maintain the order you created while getting organized. 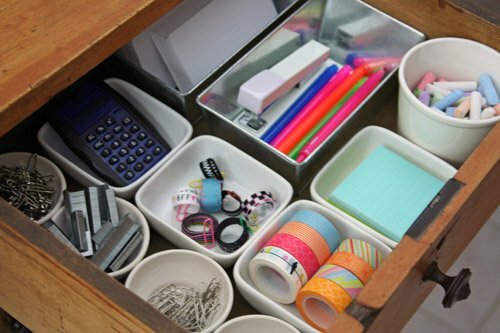 Which means, to stay organized, you will very often have an organizing project or two on your to-do list. For someone like me who enjoys the process of getting organized, this is terrific news! There will always be a fun and rewarding organizing project on my list. But, if you don’t enjoy the organizing process, this news can be quite sobering. Regardless of which camp you’re in, the trick to staying organized is to find your preferred style. Are you a proactive organizer or a reactive organizer? With proactive organizing, you diligently maintain your organizing systems, taking action before things get too far out of control. One might expect that most professional organizers fall into this category, maintaining a relatively organized home at all times. This organizer, however, does not. Remember, I enjoy the process of organizing, in large part because I enjoy the visual transformation. So, I actually prefer to let things get a bit messy before I step in and maintain my organizing systems. This means my approach to staying organized is more reactive. If you’re just setting out to get more organized, then chances are good you’re more of a reactive organizer. You wait until you can’t stand the clutter any more and then you take action. The potential downside to this approach is that if you wait too long, the clutter may become so overwhelming that you begin to feel paralyzed and don’t know where to start. (If you’re currently feeling this way, be sure to check out my mini guide Help! I don’t Know Where to Begin!) If you often find yourself feeling overwhelmed by clutter, then consider proactive maintenance strategies, instead of being reactive. You don’t enjoy the process of getting organized. Clutter makes you feel overwhelmed or even paralyzed. You enjoy the process of getting organized and feel a sense of excitement or satisfaction when you transform a messy space. You don’t get easily overwhelmed by clutter. You enjoy spending your free time working on organizing projects. Your mission for today is to consider which approach works best for you and share your thoughts in the comments. Then, stay tuned! In my next quick tip (blog post) I’ll share organizing maintenance strategies that will work great for your organizing style. I’m a reactive organizer, I don’t get overwhelmed with the scope of a project, I enjoy the process for a while but I often run out of time to completely finish a bigger project so I live with better but sadly not often DONE. I am more successful when I work on smaller projects. Great insights, Kelly! If you do find yourself with a bigger project than you like, you could try bite-sizing it by working on small sections at a time. Just a thought! Thanks for sharing your comment. I am a proactive organizer I get froze if I leave the ” snow bowl”. Grow. That’s awesome! There are very real benefits to being proactive. I am definitely a proactive organizer. While I definitely enjoy working on an organizing project, I’m much more calm when I know everything has spot. Sometimes it takes some time to figure out what’s going to work functionally for my family’s daily routine, so some tweaking is necessary, but I’m more satisfied when I have working organizing systems in place. It brings great joy to my day-to-day life actually! My husband says I’m crazy, but secretly I think he loves the order too. I bet your husband does secretly love the order, too. I bet he would miss it if it were gone. I have some traits of each but I’m more proactive than reactive I think. I enjoy organizing but have little time for it and I do get overwhelmed. Good insights, Carolyn! Sounds like you know what works for you which is a terrific place to be. I think I am pro-active, because I fall in all three descriptions that you give. I don’t know where to start: e-book or class. I need to think about it. I do need to get organized desperately before I look like a hoarder which I hope I am not. However the clutter is closing in on me. You can definitely be a little bit of both. In fact, that probably best describes me – more proactive in some areas, and more reactive in others. All my life I have been defining myself as a non organized person… because my mom was a proactive organizer, but now I get it. I am a REACTIVE ORGANIZER! I actually let things get a little crazy because it thrills me to think about how I will organize them later on, and I usually come up with new ways. I do get overwhelmed when, organizing one part of my house (say the linen closet) some of the things there have to go to another space (clothes closet) that is not organized yet.